A long time ago (I won’t bore you with the exact number of years, lest you calculate just how terrifyingly close to 40 I am already), my boyfriend (now husband) lived in Florida while I was attending grad school in New Jersey. Every few months I would make the exceedingly boring eighteen hour (each way!) drive to see him for a long weekend. My classmate, and good friend, Omar had friends in Florida as well, so I always tried to entice him to make the trip with me. The very first time we went, I promised we could buy and listen to any book on tape (yes, tape – stop counting on your fingers), my treat. So before embarking on our epic journey, Omar and I hit Barnes & Noble where he made a beeline for the first Harry Potter book. Harry Potter was moderately popular at that point, but I wouldn’t call it mainstream. I wasn’t sure what to expect of the series, but knowing my love for RPG games and fantasy novels, Omar was quite insistent I would enjoy the book. He was so right. SO. RIGHT. It became our road-trip go-to and we quickly burned through all the books released at the time. (Well, except during exams season where I ruled with an iron fist and insisted we listen to contract law lectures. Sorry about that, Omar). Since then Harry Potter has become a huge part of my life. From those wonderful memories of driving with a good friend and fellow fantastical fiction lover, to introducing the books, movies, and theme park world of Harry Potter to my own children. (You can see my oldest reading at the dinner table in our Pizza Recipe Dough post!) We’ve even started listening to the series as a family on our road trips. Although now in digital format. Hah! When my friend Marissa from Rae Gun Ramblings asked me to participate in her yearly Harry Potter extravaganza, I knew I had to do it! 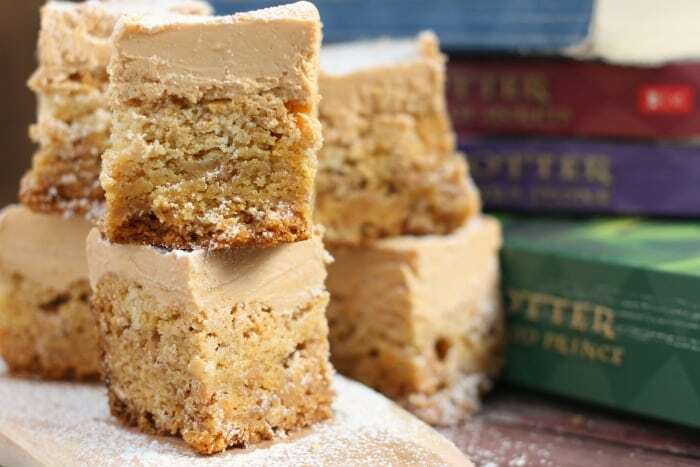 And really, what is more iconically ‘Harry Potter’ than Butterbeer? I would say, arguably nothing. (Nothing). So, naturally my first recipe is inspired by the delicious drink! And yes, I said first recipe. Because once my wheels got turning I couldn’t just stop, so keep tuned in for Molly Weasley’s Cinnamon Sunset Cocktail coming soon. She and are are basically the same person. So, of course I had to do a recipe in homage to her. Of course. 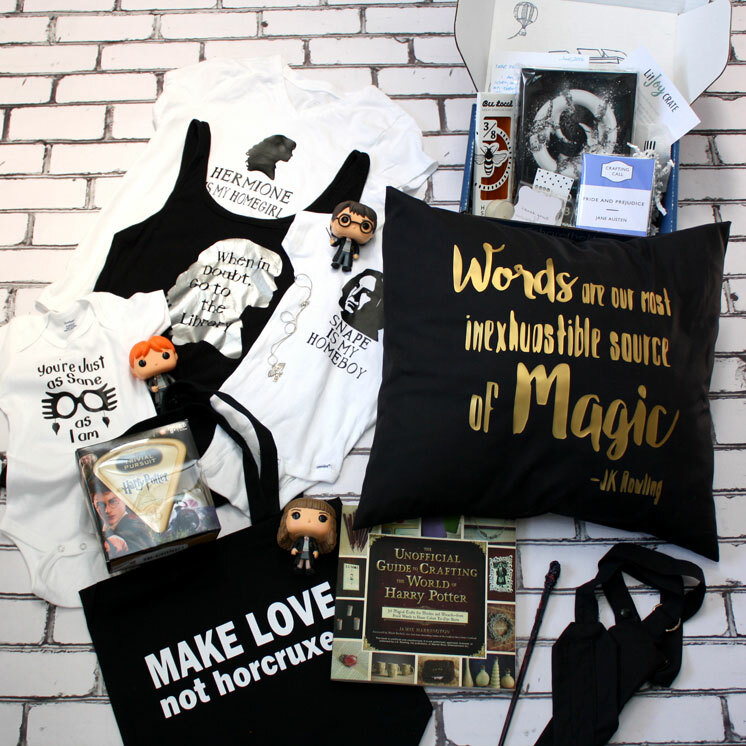 You definitely want to check out Marissa’s massive (I’m serious, it’s MASSIVE) Harry Potter Happy series with dozens of talented bloggers and more prizes than I can even wrap my head around. I almost didn’t want to participate as a contributor so I could enter! It really is incredible. I’m participating in the second leg of the contest (see below), but make sure to hop over to Rae Gun Ramblings and enter for the first prize pack as well! 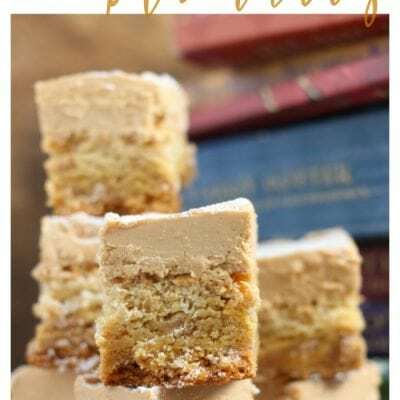 This Butterbeer Fudge Topped Blondies recipe was developed in conjunction with the Happy Harry Potter series at Rae Gun Ramblings. Yay! In a mixing bowl, combine cake mix, eggs, and oil. Beat until fully incorporated. Pour batter into a parchment lined 9x9 cake pan and bake at 350 degrees for 15 - 20 minutes, or until a toothpick comes out clean. 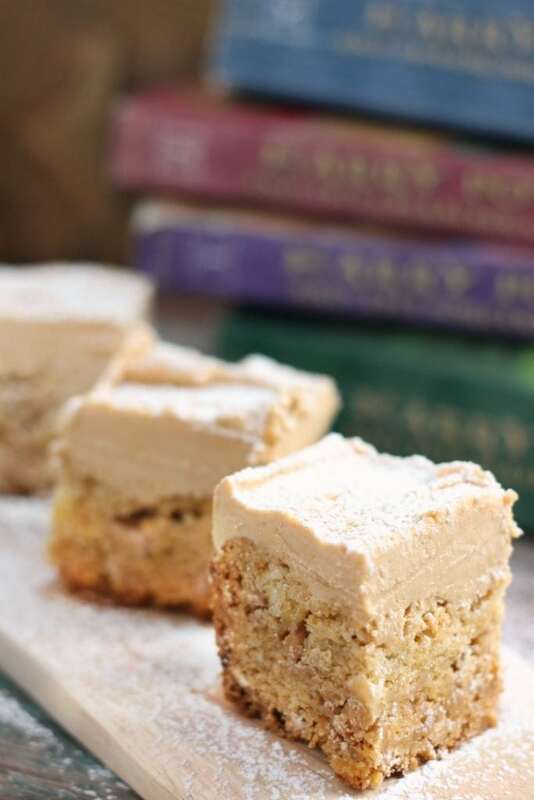 Allow blondies to cool completely. 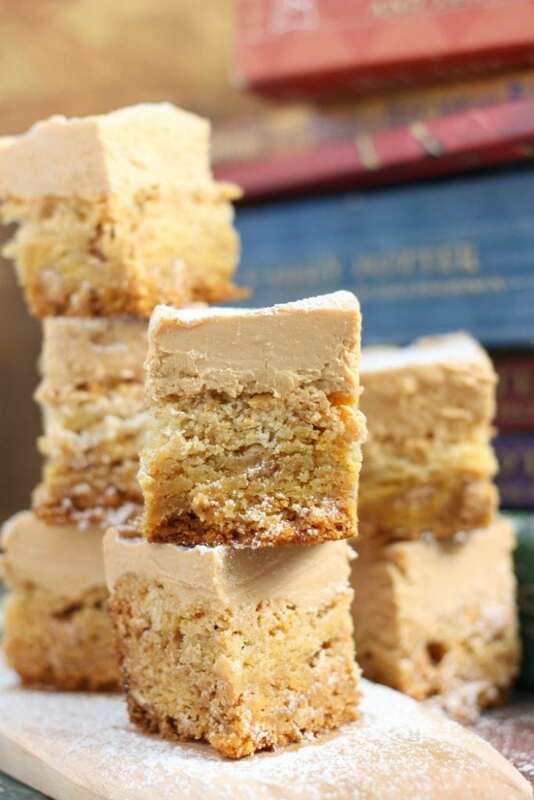 When blondies are cooled, pour second package of butterscotch morsels into a microwave safe bowl. Heat in 20 second increments (stirring in-between) until morsels are completely melted. 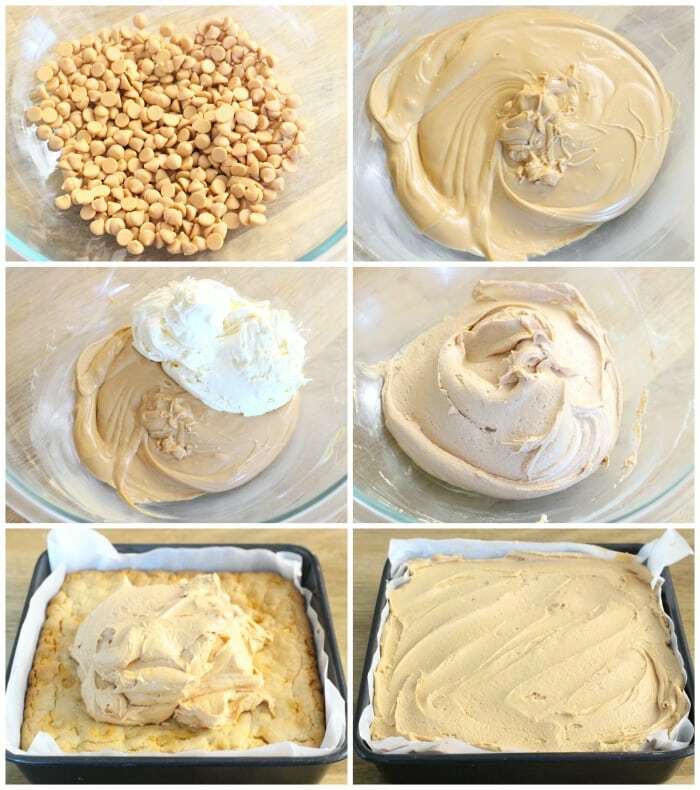 Add buttercream frosting to melted morsels and mix well. 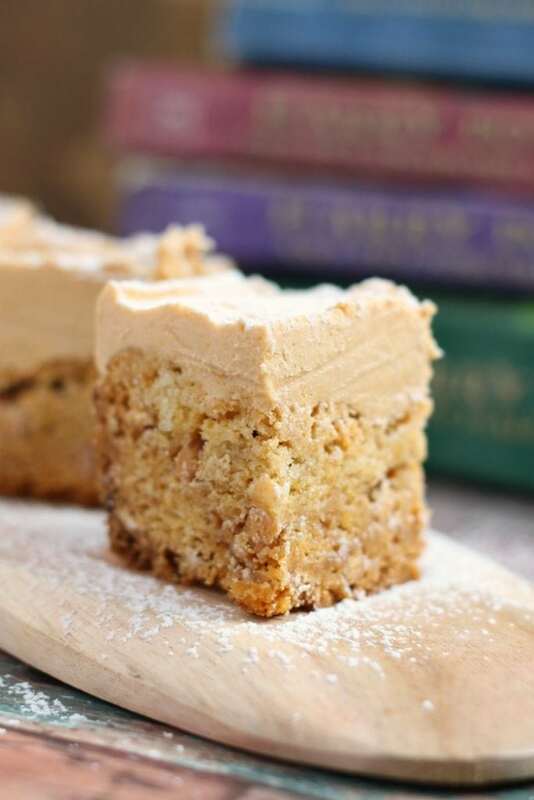 Spread fudge mixture over blondies. 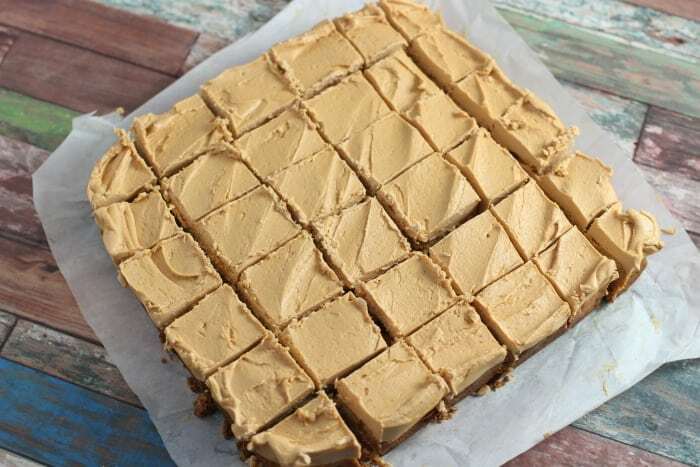 Allow fudge to set (I prefer to do this in my refrigerator), then remove blondies from pan, cut into squares and dust with powdered sugar. 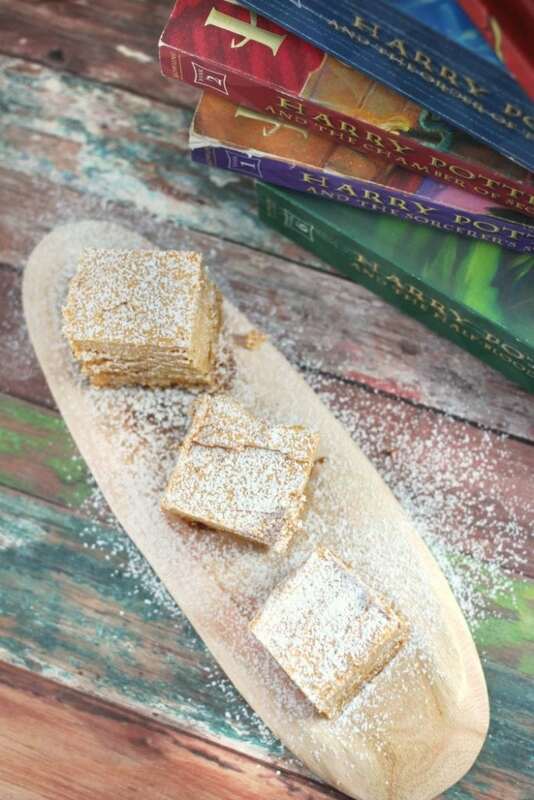 Open up your favorite Harry Potter book, brew a cup of tea, and ENJOY! 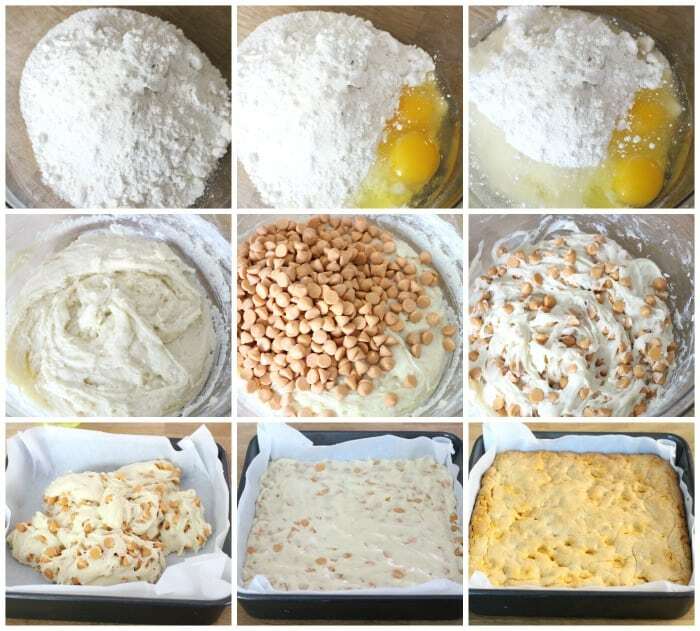 Pour batter into a parchment lined 9×9 cake pan and bake at 350 degrees for 15 – 20 minutes, or until a toothpick comes out clean. 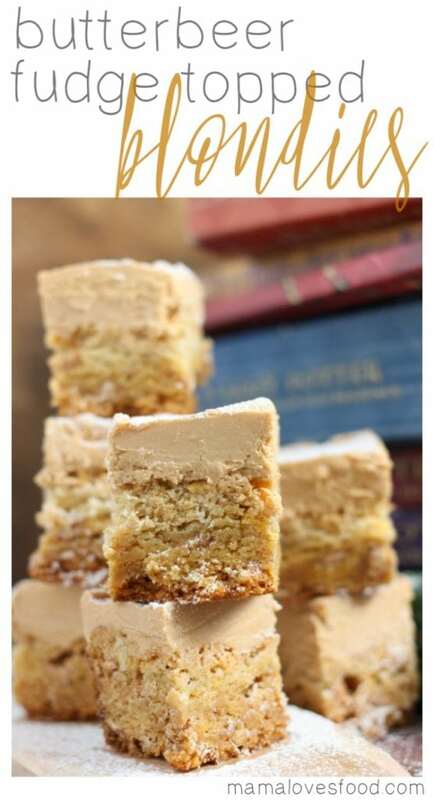 Allow blondies to cool completely.